What’s important to a colonist’s quality of life on the Frontier? Why, clearly: Food, safety, work conditions, and having a good place to sleep. We’ve been using the memory system to convey the importance of these factors but the results have been somewhat unsteady, prone to being thrown off by extreme, random factors. To be fair, it’s pretty upsetting when Fishpeople eat your friends, but that’s a difficult emotion to balance against something as simple as getting a good meal every day. Possibly our random name generator’s finest work yet. Quality Wood loves the outdoors, as you can see by his “Pioneering Spirit” trait (just look past the morbidity and mushroom-love; the little tree there). Therefore if he is performing assignments outdoors, he’ll have increased happiness. He will also not become unhappy if forced to sleep outdoors – he’s a Pioneering Spirit, after all, and expects that some hardship is necessary. Other characters will be much less pleased to find themselves in such a situation. Doomed and injured? His story may not end well. Wolfram Tar was forced to sleep on the floor. Because he is of the lower class, this is acceptable and has no strong emotional effect on him. If you provide a cot, he’s going to be well satisfied by this. I will note here that characters will still produce short-term memories for acts such as sleeping on the floor or working in a poor quality workshop. It’s just that now the emotional effects of these conditions will remain in effect regardless of whether they are recent memories or not, so the quality of life conditions are always important, even if your friends are eaten by Fishpeople. Ignore the fishpeople there. They aren’t real. Now the last condition which I have not yet named is somewhat more abstract: “Crowding”. This is a catch-all gamey mechanic that makes everyone a little less happy and a little more angry/despairing as your colony rises toward a higher population. This should give a subtle push toward increased Interesting Times as a colony becomes more successful. These are new factors of course and are very much going to be hit with iterative balancing. 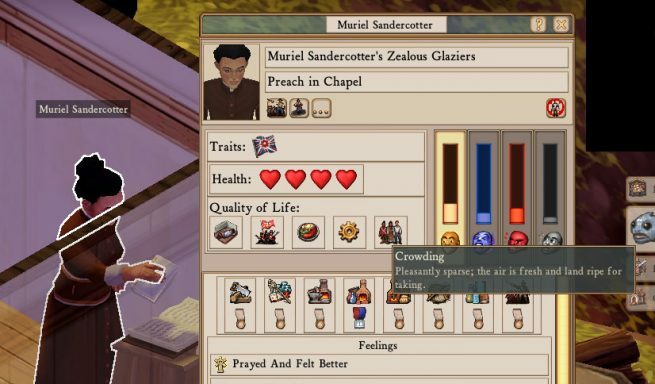 But we think that even now that will make establishing basic necessities a much more clear-cut path to promoting colonial happiness, and when the system is fully operational the quality of life indicators will give clear feedback for how you can improve your colonists’ lot in life. So let’s get out there to build some cots and boil some stew to make some colonists happy! 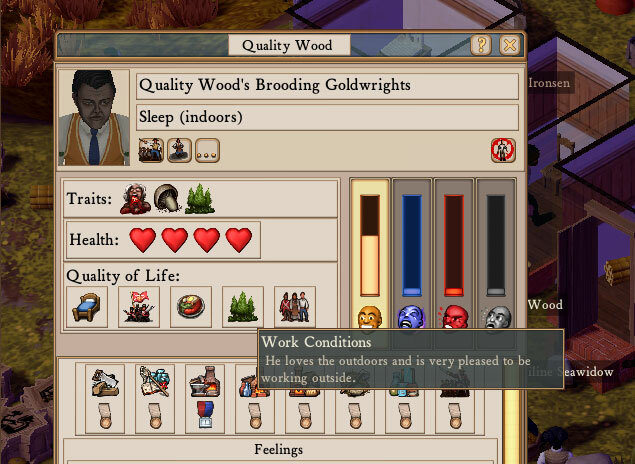 Posted in Clockwork Empires	| Tagged 'woodsy odour': +5 happiness, Also pictured: new snazzy tooltip style, do not mess with an epicurean dragoon, it's the bare necessities, Old mother nature's recipes, quality wood, the deadly narrot, When you look under the rocks and plants and take a glancy at the fancy ants and maybe... try a few? Look, it’s the Frontier, we gotta get ‘ard. Definitely seems like being careful about population is in order. Can we turn down overseers until we want them soon? Will quality of life matter at for lower class colonists at all? Seems like as of now, all that matters is how happy the overseers are, since the entire workgroup levels together, revolts together, etc. based on overseer mood. At least that’s how I thought it worked… could be wrong. QoL is much easier to fulfill for the lower class and you want to keep them happy mostly so they don’t flip out and upset your middle-class overseers by doing something awful. So while it’s true that the middle class is much more important, you should be keeping everyone happy. Apologies if I’m just bein’ stupid, but hear me out. In order to figure out the quality of life for any given colonist, we need to open the character window and hover over each icon, right? Do the icons change if quality of life changes? Or are there any other at-a-glance kind of indicators? Just trying to figure out how much mousing will be needed to suckle that sweet, sweet information nectar. The icons do indeed change, and their effect (plus that of applicable memories) is displayed in the emotion bar tooltip as well. This entire set of UI is intended to be functional rather than polished, so rest assured that usability will be a consideration. 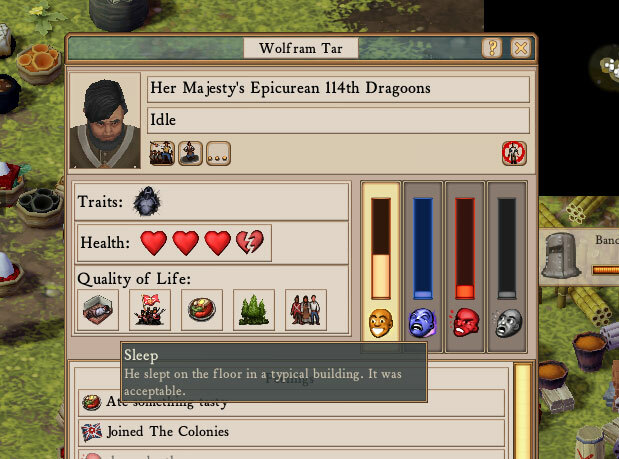 I’d kind of like a global QOL window we can open and just see how the average of the colonists feel about their food/sleep/safety/fishpeople situation. So is crowding actually about population density as the name implies, or is it just looking at total population? I think the discussion here on the QOL UI is an is an interesting one. I mean(in game and as the player), what does it meant to look at the UI to understand a citizen? Are you the Bureaucrat running the show, and by opening the UI, does that symbolically represent you doing your job by inquiring on an individual? What does it mean to have the Data aggregated in one location? What if you had to have a bureaucratic office that had to be manned to be able to look at aggregate data? I don’t picture that being fun, but where is the line drawn (in the sand of ‘fun’) for the availability of data? Are the states binary or can they have a scaling factors? All interesting especially for the long term replayability. I guess there could be different settings that limited information or weight of individual traits.